Centralized configuration for web, mobile, IoT, and more. 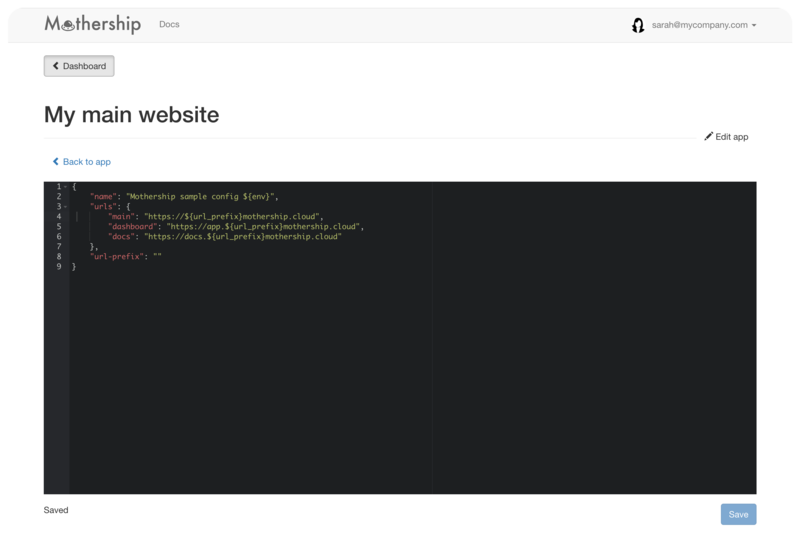 Mothership is the cloud-native way to configure all of your apps and devices. Get started today, no credit card required. Whether you're deploying to production, staging, or even running on a laptop, you can keep a consistent configuration regardless of the environment. Set sane defaults and override only what you need. Environment variables are unwieldy and difficult to manage. Treat configuration as "just another resource" for a true twelve-factor approach. Whether you're building a few microservices or a thousand, Mothership can support every deployment, no matter how big or small. One free app and up to two environments. Perfect for developers and small startups. Build a base config that applies to most environments, then apply deltas on top as needed. No more duplicating configs for environments that don't need it. Mess up a config setting during your last deploy? Want to change a setting on the fly? Just modify your environment and go. The next time an app requests its config, it'll get the change. Grab one of our official web or mobile SDKs, or use our public REST API and roll your own integration. All of our SDKs are open source! Whether you're building a new app or updating an existing one, you'll be up and running with Mothership in minutes. Open a ticket or email us directly at: [email protected] and get a response within 24 hours, 7 days a week. © 2018 Mothership (a product of Spicket). All rights reserved.